We aim to have the best value delivery service of any online hair and beauty wholesaler in the UK. *Subject to stock availability. If any item you've ordered is not in stock, we'll get in touch straight away to explain when you'll be getting it. ** Orders weighing more than 15 kg will be subject to a heavy goods surcharge. Need delivery outside the UK? Find out about our International Delivery here. Delivery charges are quoted ex. VAT (like all prices on our site). VAT will be added to your whole order at the checkout. 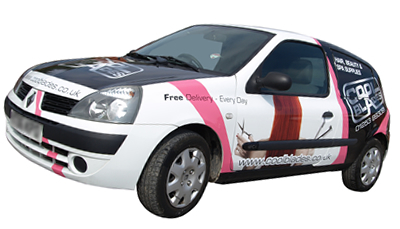 Delivery times can't be guaranteed as our couriers won't guarantee them to us. However the vast majority of orders arrive within the time estimated for that delivery method. Orders where the billing address differs to the delivery address may take longer due to extra security checks. We do this to protect you from fraud. If you ask us to leave your order outside your property, your package becomes your responsibility once delivered and neither we nor our couriers will accept liability in the event that it is subsequently stolen. Furniture usually carries a delivery surcharge depending on the size and weight of the item ordered. If applicable, this surcharge is added to your chosen delivery rate at the checkout. Peroxide, acetone and aerosols can only be shipped with certain couriers, therefore some of the options outlined below will not be available if your order contains any of these products. We regret that we're unable to ship dangerous goods to any overseas destinations. Time: 4–10 days. Rate: from £2.50. Weight: up to 2 kg. Only available on orders of £10 or lower. To keep costs down, this is our slowest delivery option and you should allow 4–10 days for delivery after dispatch (although many orders will arrive faster). Rates start at £2.50 and are tiered dependent on the weight of your order. Time: 2–3 days. Rate: from £4.95. Weight: up to 20 kg. Rates start from £4.95 for orders below £50 and are FREE for orders above it. Time: 1 or 2 days. Rate: from £5.95. Weight: up to 50 kg. We offer next-working-day delivery on orders placed before 2pm, Monday to Thursday. Orders marked "Next-Day Delivery" but placed after that time won't be despatched until the following day and will be delivered the next working day after that. Orders placed on a Friday will not be delivered until Monday. Orders placed at the weekend or on a bank holiday will be processed on the next working day and delivered on the day following that. Our Next-Day service is available in England (excluding Isle of Wight and Scilly Isles), Wales and the Scottish Lowlands and costs £5.95 for orders under 25 kg and £11.50 for orders between 25 and 50 kg. We use FedEx for these deliveries who we've found offer the most reliable next-day service, but please note that next-day delivery is not guaranteed. Throughout the rest of the UK we offer a Rapid service. Most deliveries with this service will arrive within 2 days, but customers in the most remote areas or in areas that require a water crossing may have to wait longer, particularly if the weather is bad. Our rapid service starts at £6.95. Rates are tiered dependent on the weight of your order. Credit card sales marked for next-day and rapid deliveries are always sent to the billing address for the card, even if a different delivery address is entered. This helps us to prevent fraud. We use FedEx for most international deliveries and offer a Priority (2–3 days) and an Economy (5–7 days) service. Please note that to some countries, the Priority service is actually cheaper than the Economy one. Where that is the case, you may only be offered the Priority service. We're also able to offer next-day delivery to the US and Canada. Prices vary depending on the weight of your order, so please make up your order and then go to the checkout to see what the delivery charge will be. Prices to Europe start at £11.50 (£9.99 for Eire). Prices to the US and Canada start at £12.50. When ordering goods from Cool Blades Limited for delivery outside the United Kingdom you may be subject to import duties and taxes which are levied once the goods reach the specified destination. Any additional charges for Customs clearance must be paid by you. Cool Blades Limited has no control over these charges and cannot predict what they may be. If you are ordering goods from outside the United Kingdom, it is your responsibility to comply with all the laws and regulations in the country in which you are receiving the goods.